Wait a minute – wasn’t the iPhone 4 released on the Verizon network only 4 months ago? Well, that hasn’t stopped the Verizon iPhone 4 from exploding in popularity and also stealing – or I should say eating away – at AT&T’s iPhone 4 marketshare. Take a look at the charts below. 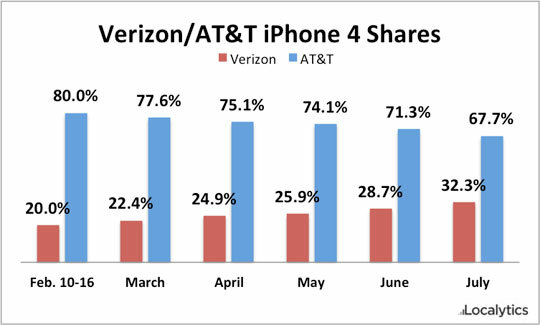 What you’ll see is that after only 4 months, Verizon’s iPhone 4 marketshare has spiked to a whopping 32%, while AT&T’s iPhone 4 marketshare is in a steady decline.